When Dana Kanhai's husband was accepted to a PhD program in kinesiology at Michigan State University (MSU), it was a natural choice for her to accompany him to East Lansing. "What newlywed couple doesn't want to nurture their marriage and have new experiences together?" asks the native of Trinidad and Tobago, who arrived in the United States with her husband in fall 2011. However, the decision to come to the United States also came at a price for Kanhai, who earned a master's in clinical psychology at Valdosta State University in Georgia several years ago. As the spouse of an international student, she is not allowed to work in the United States despite her own educational qualifications. Kanhai is not alone. 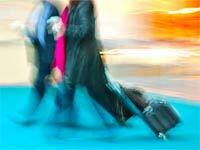 In 2012, nearly 65,000 F-2 and J-2 visas were issued to family members accompanying international students, scholars and exchange visitors to the United States, according to the U.S. Bureau of Consular Affairs. While spouses on a J-2 visa may be granted employment authorization, husbands and wives on F-2 visas—like Kanhai—are unable to work in the United States. "A significant majority of us have degrees, eg. Bachelor's, Master's or even PhDs or medical degrees and have had jobs and careers in our country of origin. Being a dependent in the truest sense of the word is new to us. It was very different and strange for me not be working anymore and earning my own income," Kanhai says. Kanhai has kept herself busy through her involvement as a group leader for the International Spouse Connection (ISC) program at MSU. Founded by international spouses, the program continues to be spouse-led and provides a forum for members to connect with and lend support to one another, as well as continue to develop professional skills through presentations and volunteer work, practice English in a safe space, and explore their new community together. While MSU's program is spouse-led, other institutions have developed family support programs run by university staff. The MIT Spouses & Partners program, for instance, is currently run by two part-time staff. However, according to program assistant Adrielle Stapleton, the program wouldn't be able to function without considerable volunteer support. They have organized initiatives such on-campus childcare during MIT student group and departmental meetings, babysitting nights, wellness classes, and a children's clothing and toy exchange. The program helps new international families navigate the university system and connect to campus resources, as well as provides opportunities to learn and practice English, introduce families to the Boston area, and provide a social outlet for spouses. 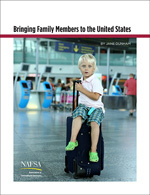 Jane Dunham, who recently authored a NAFSA guide for international students and scholars who bring family members to the United States, says that with some exceptions, such as those noted above, many institutions do not provide adequate support for international spouses. "People who come from other countries as family members often feel isolated if they are not also studying or working themselves. Many have young children and live in cramped quarters, and sometimes they don't have transportation to move around easily. Their partners study or work long hours at the university, and are fully engaged in speaking English and socializing with others. The dependent spouses have few resources to make friends and lead a life of their own, which puts pressure on the primary visa holders," says Dunham, who has worked with community programming for more than five decades and maintains a website on programming for those working with international spouses and families. Jing Yang, who came from China with her husband in 2009 when he enrolled in a PhD program at MSU, echoes this sentiment. "I came [to] a totally strange county, and had almost nothing to do except housework and wait for my husband to come home from school. There are lots of spouses just like me. In order to stay with our spouses, we have to give up our own lives. I think with universities' support, spouses can find a new social network more easily, so students and scholars can focus on their study and research," says Yang, who has been involved with MSU's ISC program. "Some universities and community organizations recognize the needs of international family members and provide activities and resources to help them get adjusted and feel a part of the community. They understand that happier family life leads to better concentration on studies and research for the internationals who come to the university. Conversational English, host family programs and regular gatherings for spouses are excellent ways to bring family members into the community," Dunham adds. Kanhai suggests that institutions hold a spouse orientation during the larger international student orientation and conduct a survey or focus group to determine spouse needs on a particular campus. Another area where universities can help is by promoting volunteer opportunities for F-2 visa holders and offering support for J-2 visa holders to find employment. She adds that institutional efforts can be as simple as providing a meeting and advertising a time and date to gather. "Any university with a substantial married international students population can easily start a support group for spouses. The support group can be self-sustaining. It doesn't take much to bring people together and help them connect with each other," Kanhai says. Charlotte West is a frequent contributor to International Educator magazine. She lives in Seattle. What type of programing is your institution offering for international spouses? Connect with other international student and scholar advisers.